This article by Karen Rosenberg appeared in The New York Times. Unfailingly glamorous but aloof enough to earn comparisons to Garbo, Marisol did not feel the need to explain her travels or the seemingly impetuous twists in her art making they sometimes prompted. After appearing in the 1968 Venice Biennial and that year’s Documenta, for instance, she went off to scuba dive in Tahiti; her next New York show consisted of pastel seascapes and carved wood sculptures of exotic fish. Her individual works could be similarly unpredictable, combining woodcarving and assemblage, Pop and pre-Columbian and folk art. Her relationship to Pop, in particular, has long vexed writers: The influence of her close friend Warhol can be seen in her winking early-1960s portraits of Kennedys and movie stars, but later works veer off into more personal subject matter and sincere expression. In today’s art world, however, globe-trotting is rewarded and eclecticism expected. The same qualities that frustrated Marisol’s earlier critics now make her ripe for reappraisal, as does the faux-naïve character of her work — a mix of drawing, carving and assemblage — in these “outsider”-friendly times. This is the task of the small (30-piece) survey “Marisol: Sculptures and Works on Paper,” organized by the Memphis Brooks Museum of Art and now at El Museo del Barrio (where, in addition to counting as the artist’s first New York City museum solo, it inaugurates a multiyear celebration of female artists). But in taking on this show, El Museo has missed a major opportunity. As a museum devoted to Latino, Caribbean and Latin American culture, it could have expanded the Memphis Brooks show to focus more on Marisol’s Venezuelan roots. That emphasis is there, at least, in the substantial and scholarly catalog, where Deborah Cullen’s fascinating essay “Reframing Marisol: Latin American Contexts” details the ex-votos (small casts of body parts offered in shrines and churches), retablos (relief paintings with small boxes for figurines) and other folk and indigenous art forms that have influenced Marisol’s sculptures and drawings and that deserve at least as much scrutiny as her ties to American Pop Art. The work looks fantastic, though, the early works especially, with some of the artist’s signature sculptural tableaus set off by accent walls of yellow, royal blue and Pepto-Bismol pink. Marisol’s “Women Sitting on a Mirror,” of 1965, beckons with its seemingly contradictory nods to folk assemblage and upper-crust fashion, as does “The Family,” a funky nativity scene from 1969 that is dominated by a neon-haloed, heavily bedazzled Virgin. 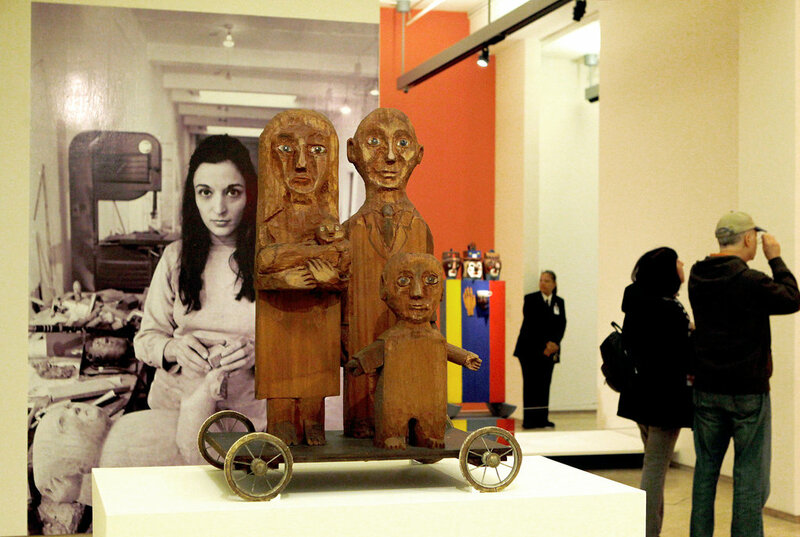 It’s apparent from the show’s first sculpture, “The Hungarians” (1955), which features a mother, a father, a toddler and an infant, their eyes bulging from eerie, hollowed-out faces. Later comes “Mi Mama Y Yo” (1968), an antic mother-daughter duo with delicate cast faces atop boxy, robotic bodies of pink-coated aluminum, and the haunting lithograph “Family Portrait” (1961), which incorporates a childhood photograph of the Escobar family. As a general rule, Marisol’s multifigure tableaus are much richer than her single-figure sculptures. Her portraits of famous artists like Magritte and Picasso and political heroes like Bishop Desmond Tutu of South Africa lack the theatrical energy of grand assemblages like “Self Portrait Looking at the Last Supper” (which is not in the show but is on view nearby, at the Metropolitan Museum). These individual sculptures proliferate in the exhibition’s final galleries, causing the show to lose momentum. It has a powerful ending, though, in the 1996 work “The Funeral.” Based on the famous photograph of John F. Kennedy Jr. saluting his father’s coffin, it shows a carved wood toddler looming, Gulliver-like, over a procession of toy-size mourners (some of them joined like paper dolls). As a lovingly handmade interpretation of a mass-media image, an empathetic treatment of a truncated childhood, and maybe even a kind of Roman Catholic “santo de palo,” or “saint made of wood,” it reminds you that Pop Art was merely a point of departure for this peripatetic artist.